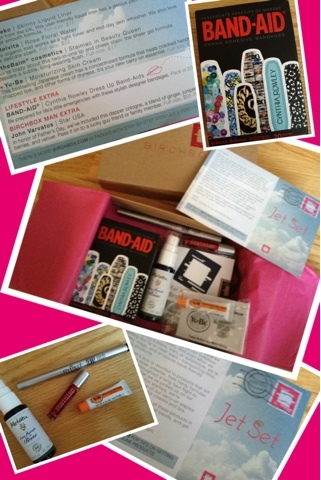 This month's Birchbox was again ah-mazing. I've been impressed with the past few months already so I was quite pleased when I received my June box. First two items that popped out, not only because they weren't wrapped in the tissue paper, were the Cynthia Rowley designed bandaids and the Eyeko Skinny Liquid eyeliner. How did Birchbox know I needed new bandaids? Perfect for any cuts or emergencies with new shoes, these designer bandaids are super cute. I also immediately tested the liner and loved its super fine pointy tip which will make all applications precise. (need that steady hand though!) Also the formula didn't smudge which is perfect. The other items were theBalm's Stainiac in Beauty Queen - a two-fer- cheek and lipstain, Yu-Be moisturizing skin cream sample and Melvita's Rose Floral Water mist. Also a Birchbox Man extra- a cologne in honor of Father's Day- was included in my box. The 6 items in my box were pretty spot-on with their theme JetSetter as I will definitely be carrying these on my getaway next month! Birchbox has already announced its partnership for July's curated box with Glamour and I cannot wait! I officially joined last July and I'm excited to celebrate my one year anniversary with Birchbox next month! If you haven't joined yet... what are you waiting for? Get your Birchbox goodies!